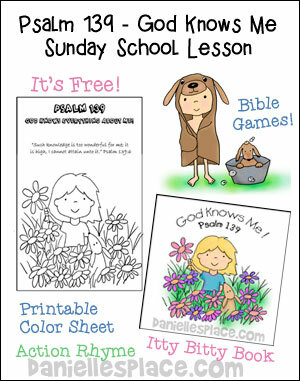 The following crafts come from the Bible lesson, "Jesus Considers Others - Jesus Pays the Temple Tax" on The Resource Room. 1. Cut the white rim off of one of the cups. This one will be used for the tail fins. Then punch two holes using a sharp object as close to the bottom of the cup as possible on opposite sides. 2. Punch two holes in the other cup as close to the top as possible on opposite sides. 3. Insert the tail cup into the fish-body cup matching up the holes. 4. Insert a brass brad into one of the holes on the fish-body cup and through the hole in the matching tail cup. Put your hand inside the tail cup and flatten out the brad. Do the same thing on the other side of the fish. If you do not have brads you can just glue the tail to the inside of the body with a low temp. glue gun. 5. Press the tail cup flat at the edge and cut it in the shape of a fin. Glue it closed with a low temp. glue gun. 6. Cut the side fins from matching paper or card stock, fold down the end, and glue it to the fish. 7. 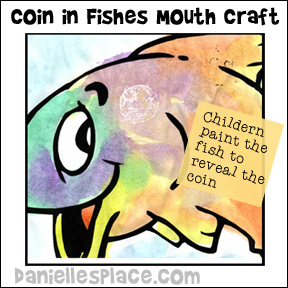 Have your children decorate the fish with dot stickers, draw a mouth and glue a paper coin to the mouth. 1. Before class print out fish pictures onto white printer paper. Place a small coin behind each picture, varying the location, and color on the fish picture, over the coin, with a white crayon. 2. In class have your children find the "coin" by painting over the picture with water color paint. The water color paint will not stick to the white crayon and the coin will appear. 1. Before class print out fish pictures and pictures of coins. If you have young children, prepare the fish before class. Leave the plastic bag stuffing in the mouth. After the children have painted the fish and the paint is dry carefully remove the plastic bags and then have your children place a coin in the fish's mouth. 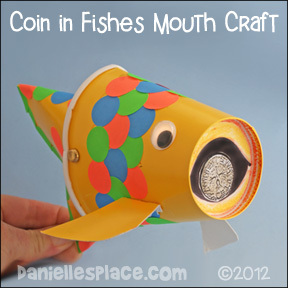 Paper coin patterns are available on the Paper Cup Fish Craft above. 1. Stuff two plastic grocery bags into the bottom of the paper lunch bag. Crinkle up the bag just above the plastic bags. Pull up on the sides of the bag to make the straight. 2. Open the bag just enough to place the paint bottle into the center of the bag so that it is standing up. Crinkle up the bag again around the bottle and secure it with a Chenille stem. 3. Carefully bend down the top of the bag over the bottom of the bag bringing it down over the bottom of the bag as far as possible. Crinkle up the bag again around the bottom of the bag to form the fish shape and secure it with masking tape. 7. When the paint is dry carefully remove the plastic bags from the fish's mouth. ©2014, Digital by Design, Inc.- *See Copyright Information - Please do not publish your pictures of this craft on Pinterest without giving Danielle's Place credit for the craft. 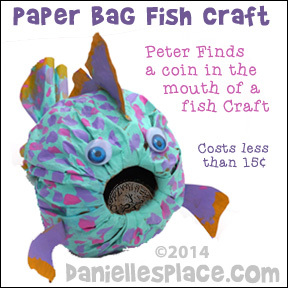 You can also use this fish puppet to act out the story of Peter finding the coin in the fish's mouth. Use the coin pattern from the paper cup fish above. Children can open and close the mouth of this fish and insert and remove the coin. The tail moves up and down to make the fish look like it is swimming. 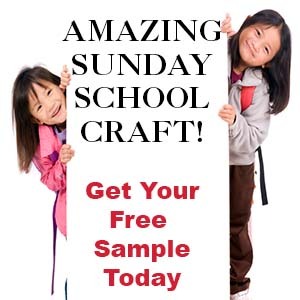 This craft takes two sheets of paper. The body is an origami cup and the fins are just a smaller origami cup attaches with a paper fastener that allows the tail to move up and down. Paper coin patterns are available on the Paper Cup Fish Craft above. 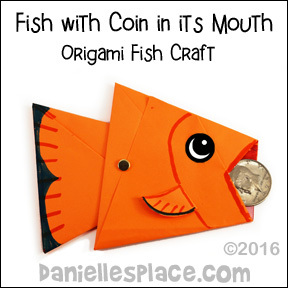 Children will enjoy putting the coins in and taking them out of the origami fish. 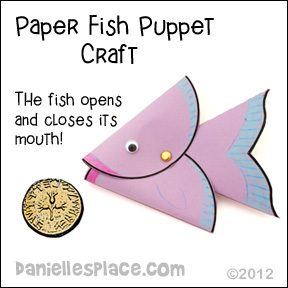 Use the fish craft to act out the story or tell your children to tell their parents the story using their fish puppets. You can find directions on how to make this craft on the Under the Sea Crafts Page. Before class make a bunch of origami fish using different colors of paper. 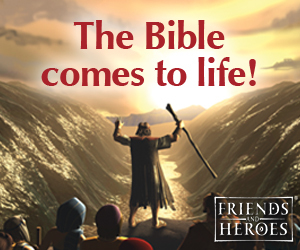 Write the words of the Bible verse or questions relating to the lesson on pieces of paper and fold them up. Place a question or word in each of the fish's mouths. Place a coin in one of the fish's mouths. Use a paper coin if you have young children. 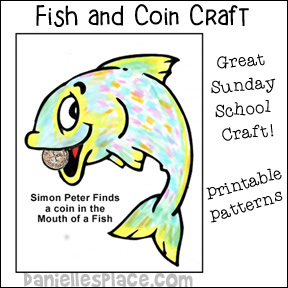 Paper coin patterns are available on the Paper Cup Fish Craft above. In class place all the fish on a table and have your children take turns picking a fish. Let them reach in the mouth and see what is inside. Ask the question that is on the paper or read the word. Place the word on the board in order of the verse. Have your children read the words each time you add another word. Keep playing until all the fishes have been picked. Before class print out the fish patterns onto card stock and cut them out. Tape a paper coin on the back of one of the fish. Place a metal paper clips on the mouths of each fish and spread them out on the floor. Make a fishing pole by tying a magnet on the end of a string and attaching it to a short pole. 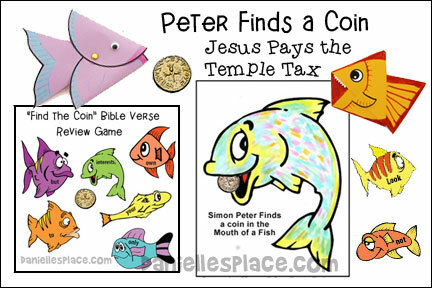 In class remind your children that Jesus paid the temple tax because he didn't want to offend anyone or make them think that he was doing something wrong. 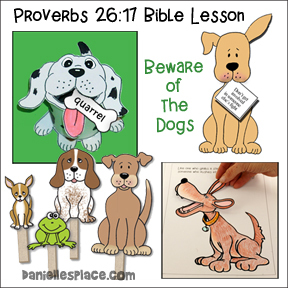 Write the Bible verse on the board and explain it to your children. Remind them that Jesus told Peter to go down to the lake and put his fishing nets in the water. The first fish he caught would have a coin in its mouth. 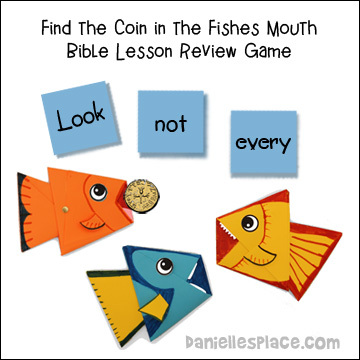 Tell your children that one of the fishes on the floor has a coin in its mouth and they are going to try and be the one who catches the fish with the coin. Have your children take turns catching fish. When a child picks up a fish have him look on the back of the fish to see if he caught the fish with the coin. If he didn't, ask him if he knows what the word is on the fish. Have him find the same word on the board and tape his fish under the same word on the board. Keep playing until all the fish have been caught. 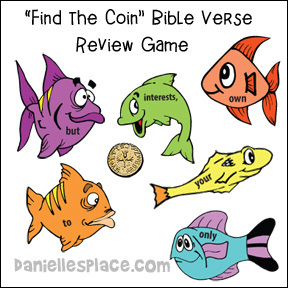 If you have older children, go over the verse several times without writing it on the board and see if they can put the fish in order to spell out the verse. (Older Children) Make two set of fish cards and divide your children up into two teams. Place all the fish on the table upside down. On the word "go" see which team can turn over all the fish cards and place them in order first.